Two of our favorite things together at last...caffeine and chocolate!! Pure Chocolate Energy is an all-natural dark chocolate energy chew, that you can take anywhere and anytime you need a quick energy boost! 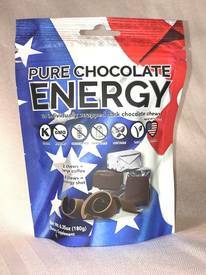 Pure Chocolate Energy’s proprietary energy blend contains Cacao/Dark Chocolate, Natural Caffeine, Apple Extract, Acai Extract, Green Tea Extract and Vitamin B-12 Each chew contains 50 mg of natural caffeine to help you power you through your day. Proudly made in the USA! Pure Chocolate Energy contains only the finest ingredients that are Kosher, Vegan, non-GMO, Dairy Free, Soy Free, and Gluten Free. All of that, and they still taste fabulous! !